A little over ten years ago, on June 7, 2001, then-President George W. Bush signed a law to cut taxes for American citizens under the promise of prosperity. However, in reality, it cost the government $2.5 trillion over the next 9 years, and ushered in an era of abysmal economic growth. The third and fourth options would not only help fight Climate Change, but it would also reduce America’s dependence on foreign oil — something that all of our last 8 Presidents have advocated for the past 30+ years, but none have been able to permanently accomplish. Perhaps the tax cuts might have been worth it (but still probably not) if they had actually promoted economic growth… but they didn’t. 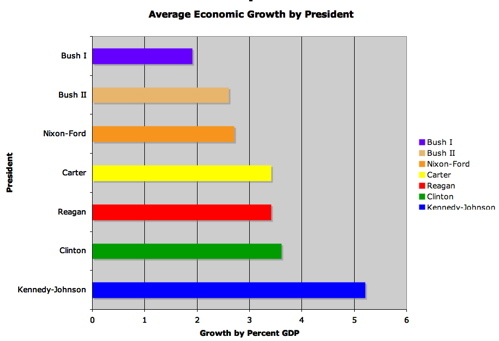 In 2008, Ezra Klein created a chart (below) based on Dean Baker’s analysis, which shows that economic growth under W was the 2nd worst of any recent President. (The worst was under his father). The tax cuts for the wealthiest 2% were extended at the end of 2010 as part of a compromise Obama struck with Republicans. While this is largely viewed as caving (myself included), it is important to remember that Republicans flat-out refused to tackle any other issues unless Democrats allowed the tax cuts to be extended. Republicans argued that increasing taxes on the wealthy during a recession would stifle recovery, because the rich (as job-creators) would use the money they weren’t spending on taxes to do things like hire more workers. So if they aren’t creating jobs, what have the wealthy been doing with their tax savings? In an article in the Huffington Post, the group “Patriotic Millionaires”revealed that they have used the tax savings to do many frivolous things, including: traveling, buying larger boats, and adding dance floors & parking lots to their mansions. This is inline with what the non-partisan Congressional Budget Office found when they analyzed which policies were the most and least effective for stimulating economic growth. The most effective policy: increasing aid for the unemployed. Republicans said ‘no’ to that. Meanwhile, the least effective policy for economic recovery was cutting taxes. A ThinkProgress.org article points out that the GOP wants to pass their Agriculture Appropriations Bill, which “slashes funding for food assistance, preventing hundreds of thousands of people from accessing aid.” If the Tax Cuts for the Wealthy were reduced by 1 day in length, we would have the revenue to continue paying for this service without cuts. For a different, and non-reality-based, perspective: Texas Governor Rick Perry thinks the economic crisis is punishment from God because we spend too much. This is similar to how he believed the solution to his state’s historic drought & wildfires was a 3-day prayer event. (It didn’t work.) 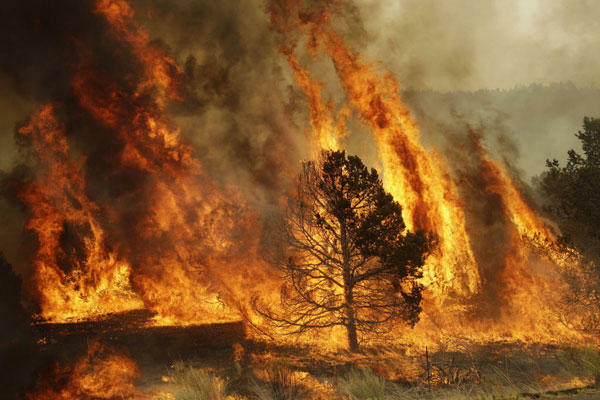 Perhaps a more worthwhile course of action would have been not to cut funding to the agency responsible for fighting wildfires. Something else that would have been helpful would have been to heed the EPA’s warnings that Greenhouse Gases are causing Climate Change, which increases the likelihood of things like droughts and wildfires. Instead, Rick Perry sued them. Of note: Texas is the most polluting state in the nation. Previous Previous post: Republicans are illegally overturning Roe v Wade. Can they be stopped?